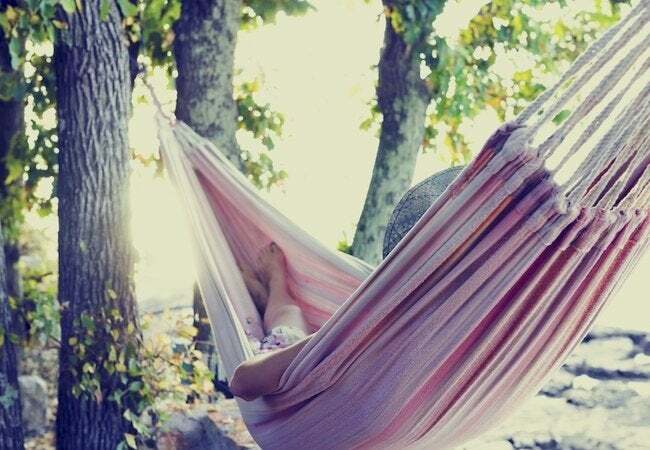 Who doesn't dream of whiling away the afternoon cradled comfortably in a hammock? 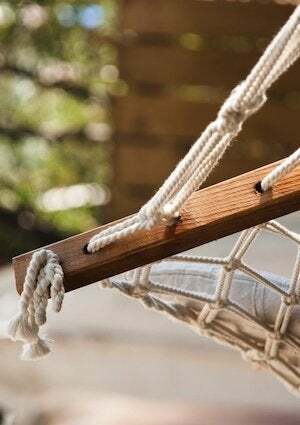 Make it your summer reality by following these easy tips on how to hang a hammock in your backyard. Choosing a location for your hammock is perhaps the most difficult part. While you probably don’t have the perfect pair (and ideally spaced) palm trees on your property, you might very well have two healthy oak, maple, or beech trees that are strong enough to support your weight. Ideally, those hardwoods would be as far apart as the total length of your hammock, fully stretched out. Though there are countless hammocks on the market, most fall into one or two design categories. First, you have traditional hammocks, and then you have hammocks with spreader bars (like the one pictured at right). Traditional hammocks are meant to hang loosely between two trees, with the center dipping down. Since they get attached to points that are six to eight feet high up on nearby trees, you can, in a pinch, consider using tree branches, not tree trunks—so long as the branches offer sufficient heft. The other type of hammock involves spreader bars, which force the hammock to remain open, so the occupant never becomes wrapped up in a hammock burrito. Unlike the traditional design, hammocks with spreaders hang only four or five feet from the ground. Also, whereas a traditional hammock hangs loosely, these hammocks hang taut; when unoccupied, they are virtually parallel with the ground. Remember that the wonderful thing about hanging a hammock is that once you’ve finished the job, your reward is right there in front you. Collapse into your new favorite spot—hey, you’ve earned a break!